There are 35 Assisted Living Facilities in the Cape Coral area, with 14 in Cape Coral and 21 nearby. The average cost of assisted living in Cape Coral is $3,630 per month. This is higher than the national median of $3,346. Cheaper nearby regions include Fort Myers with an average starting cost of $3,226. To help you with your search, browse the 385 reviews below for assisted living facilities in Cape Coral. On average, consumers rate assisted living in Cape Coral 4.2 out of 5 stars. Better rated regions include Naples with an average rating of 4.3 out of 5 stars. Caring.com has helped 10 families in Cape Coral find high-quality senior care. To speak with one of our Family Advisors about assisted living options and costs in Cape Coral, call (855) 863-8283. Cape Coral is located in Lee County on the Gulf of Mexico. With a population of 170, 063, the population density in Cape Coral is 448 percent higher than in Florida. There are 37 assisted living facilities (ALF) in the Cape Coral, Florida, area, with 13 in Cape Coral and 24 in surrounding regions, including Fort Myers. The Bureau of Health Facility Regulation licenses several types of ALFs, including standard, limited nursing services and limited mental health. ALFs in Florida can range in size from one resident to several hundred and are regulated by the Department of Elder Affairs. With less than 10 cloudy days a year, weather in Cape Coral is typically warm, with daily temperature highs of 75 degrees in the winter and 95 in the summer. This area is perfect when searching for a stable climate without cold winters. Cape Coral offers various modes of public transportation, including the LeeTran transit system and Cape Coral Mini-Bus service, the latter of which is specifically designed for seniors. This service is geared for medical appointments and weekly shopping excursions within Cape Coral. The cost of living in Cape Coral is approximately 2 percent higher than the national average and 1 percent higher than the rest of the state of Florida, making it slightly less affordable than Florida at large and the rest of the United States. Air quality is superb in Cape Coral with a score of 69 compared to the national average of 58, based on new measures of hazardous air pollutants from the Environmental Protection Agency (EPA). This could factor into a better quality of life for seniors looking to spend time outside. Crime data reveals that the overall Cape Coral, FL, crime rates are 41 percent lower than the Florida mean and are 35 percent lower than the nation's mean, making Cape Coral a very safe place to live for seniors. The Cape Coral area is home to world-class medical facilities, including Cape Coral Hospital and Prime Urgent Care of Florida, in the event of medical emergencies or illness. Assisted Living costs in Cape Coral start around $3,630 per month on average, while the nationwide average cost of assisted living is $4,000 per month, according to the latest figures from Genworth’s Cost of Care Survey. It’s important to note that assisted living rates in Cape Coral and the surrounding suburbs can vary widely based on factors such as location, the level of care needed, apartment size and the types of amenities offered at each community. In regards to public financing options, the state of Florida covers services in ALFs with either standard or specialty licenses under a statewide 1915(b)(c) MLTC program. Waiver participants must be offered a private room, private apartment or unit that is shared only by consent to be eligible for such options. Cape Coral and the surrounding area are home to numerous government agencies and non-profit organizations offering help for seniors searching for or currently residing in an assisted living community. These organizations can also provide assistance in a number of other eldercare services such as geriatric care management, elder law advice, estate planning, finding home care and health and wellness programs. To see a list of free assisted living resources in Cape Coral, please visit our Assisted Living in Florida page. Cape Coral-area assisted living communities must adhere to the comprehensive set of state laws and regulations that all assisted living communities in Florida are required to follow. 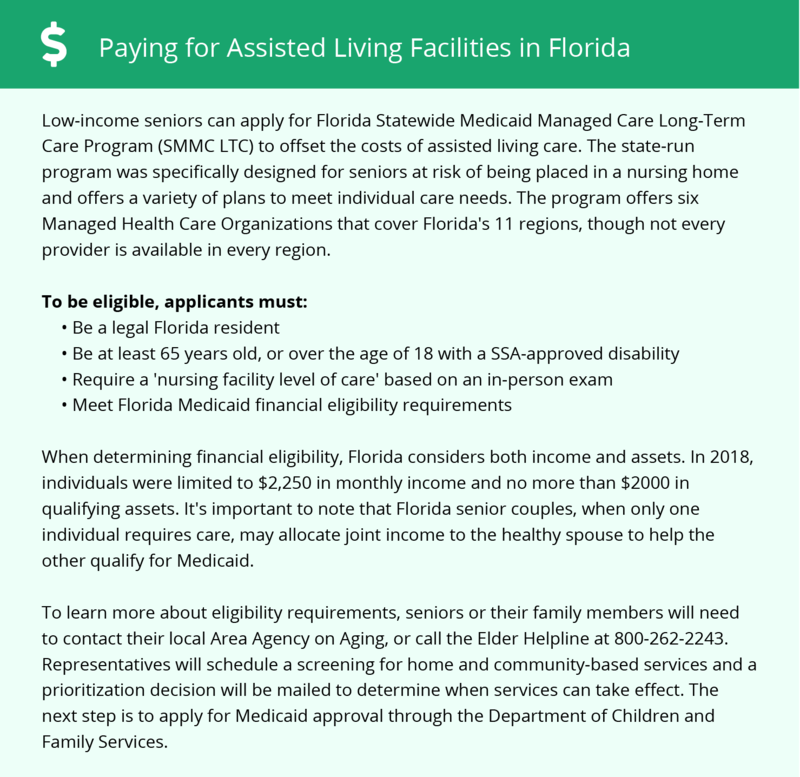 Visit our Assisted Living in Florida page for more information about these laws.